I woke up around 4:30am the morning of March 30th to get myself ready for my 3rd half marathon to date. 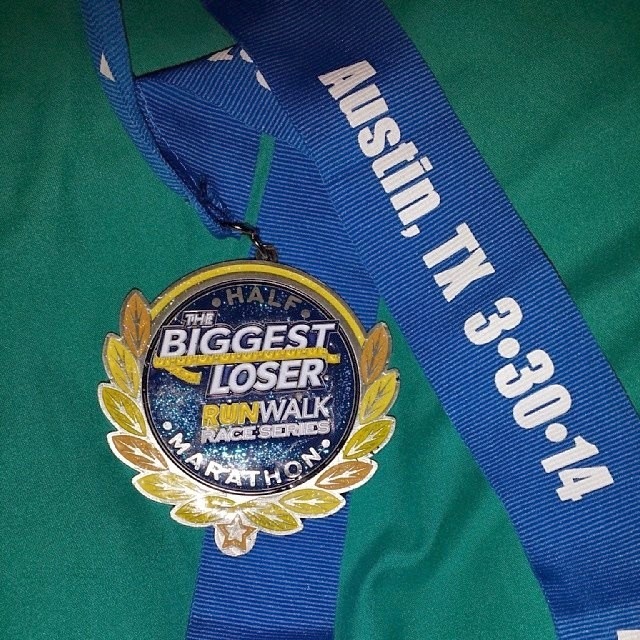 The Biggest Loser half marathon. The day before, I had purchased a cinnamon raisin bagel and a banana, my standard pre-race breakfast. I took two small bottles of water with me, one to drink before the race and one to drink on the way home. The festival area opened up at 6, so I arrived at 6 in the parking area. I wanted to make sure I got a good spot and that I didn’t get lost. So, I sat in my car, at my bagel and banana and drank my water for 45 minutes. Then I headed over to the festival area. As it got closer to the start time, I made my way to the corral. There were people holding pace sticks. I found the 11:30 min/mi pace group and decided to run with them. A couple more people joined with the pace group and we were all chatting away until the “gun” went off. I blinked my way through the singing of the Star Spangled Banner, like usual. I always get choked up, same thing with Amazing Grace on the bagpipes. It just gets me, you know? Anyway, they did a wave start and we were in the second wave. My plan was to run with the 11:30 pace group for the first 10 miles, then pick up the pace and finish with a PR. It was super nice starting off with a pace group. It really kept me from going out way too fast. For the first like half mile, I ran with my music on in both ears. Then, I realized everyone in the group was chatting with each other, so I pulled out the earbud that was closest to everyone else so I could still listen to my music (on a low level) AND participate in the conversation as well. As we all shifted around and from side to side as we ran, I would switch out what earbud was in based on my relation to the group. Eventually, probably around mile 4, our pace group leader turned the music on her phone on with the speaker, so at that point, I just turned off my music and wrapped my earbuds around the front of my tank top so they weren’t flapping all over the place. As we ran and chatted away, the miles just flew by like crazy. 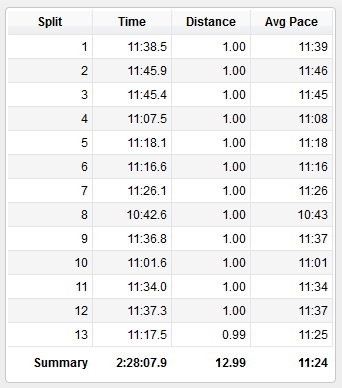 We were running a steady 11:20-11:44 per mile, most miles were below 11:30, only mile 4 was high, I believe. I think the majority of our miles were between 11:20 and 11:24 per mile. As we ran along, we noticed that the mile signs were popping up and then a little bit later our mile chimes were going off on our GPS items (for me and one other girl, our watches and for the leader, her phone app). We realized that the route might be off. 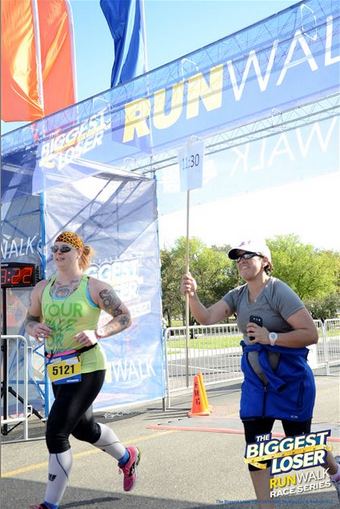 At mile 8, I HAD to use the restroom and there was a port-a-potty without a line, so I hopped on in. I used the facilities and then went about catching back up with the pace group. I managed to do that within 2 minutes of exiting the port-a-potty. YAY! As we were running along, the leader needed to use both hands to do something with her phone at one point, so I got to hold the pace stick!!!!! How cool is that?!?!?! I should have taken a selfies with it. Haha! We all even made jokes about me doing that too. But, jokes aside, it would have made a great photo for here and my scrapbook. Oh well. As we passed by the mile 12 marker, a big gust of wind picked up and blew it over…so we passed mile 12 with a bang! Ba-dum-bum. 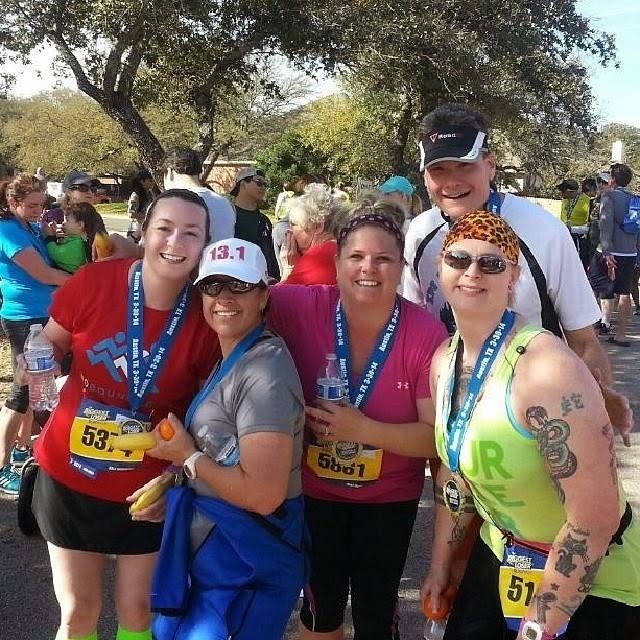 So, we finished the race and then the whole group of us (there were 5 that ran together basically the whole time) got together and had our picture taken together. And now it’s time for Friend Making Monday! 2. Favorite piece of clothing you own? Washington DC, even though it’s been almost 20 years since I was there. There’s just so much to do…loads of museums, parks, and really close drives to other places like Busch Gardens and New York is only 5 hours away. 5. Favorite strength training exercise? Very disappointed in the Biggest Loser race. First off they called it "Austin" when it was really Cedar Park area. The 5k was 45 dollars race day, the pics still haven't been posted. Oh and none of the former contestants ran 1 mile!! Needless to say won't be running any of their races again! But looks like you had a great race! You do such awesome race recaps. Well done, that is annoying about the distance, that has happened to me once before too, although normally it is more than the distance.